Saree Fabric: Art Silk (5.5 Metres Saree), Blouse Fabric :Banglori Satin (Piece: 0.80 Metres.) Made up using rich quality Fabric, this saree is light in weight and soft against skin too. Further, the Self Design. 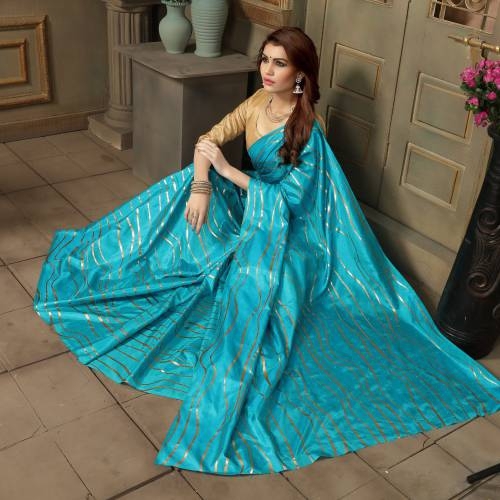 Comfortable to drape throughout the day, this good looking saree is perfect to wear during the formal hours. Get ready to flaunt off your quirky fashion sense at an upcoming formal get together by teaming up this saree with an expensive watch and a pair of heels.it comes up with a blouse piece. The Fashion Outlets is a leading manufacturer and exporter of fancy sarees in surat since 2010, the brand is. In this saree color combination is fabulous every women and girls should try at least once, please note slight color variation may be rise due to screen resolution.brings you wide range of office,party,daily wear sarees please buy them and give your valuable feedback for further developments in our product qualities.